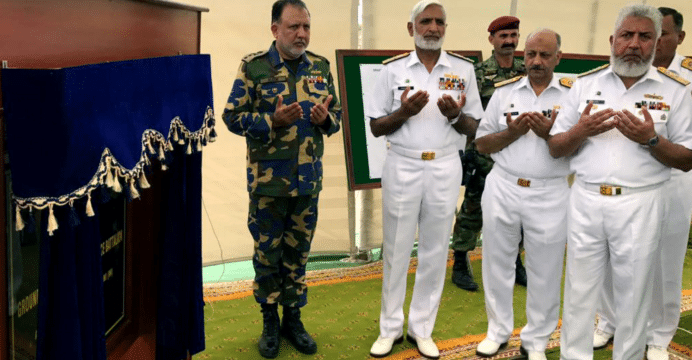 On Friday, July 14 the Pakistan Navy held a ground-breaking ceremony for the Pakistan Navy Marines 21st Air Defence Battalion in Ormara, Baluchistan. The 21st Air Defence Battalion was established in 2005 as part of the Navy’s effort to provide air defence coverage to all national infrastructure along Pakistan’s coasts, such as shipyards and deep-sea ports. In 2012 the Navy’s Marines branch was shown using several low-altitude air defence systems, namely twin 35-mm towed anti-air guns (AAG) – either Chinese Type-90s or Swiss Oerlikons – linked to Skyguard fire-control radars (FCR). It also used man portable air defence systems (MANPADS). The Pakistan Ministry of Defence Production’s (MoDP) yearbook for 2014-2015 lists the procurement of six Skyguard FCRs, one SkyGuard simulator, 12 35-mm AAGs and 500 infrared surface-to-air missile (SAM) units (likely MANPADS). It appears that at least some of these were allocated to the Marines. The Skyguard radar has a maximum range of 20 km. In response to aerial threats, the radar controller can set the linked 35-mm AAGs to fire at the target up to a range of 3,000 to 4,000 m. MANPADS, such as the Anza, Mistral and RBS-70 Mk2, can engage at ranges of 5,000 m, 6,000m and 8,000 m, respectively. It is evident that the Marines’ air defence capacity is tailored for neutralizing low-flying threats, which can be a factor considering the reality that Pakistan has adjoining coastlines with Iran and India. The Chief of Naval Staff Admiral Muhammad Zakaullah stated that air defence development was “a clear priority” for the naval leadership, especially for Coastal Command. However, it is unclear if efforts will be laid for longer range air surveillance radars and SAMs. In June 2016, the Pakistan Navy leadership had requested information from South Africa about the Denel Dynamics Umkhonto SAM system. Utilizing a terminal-stage imaging infrared seeker with mid-course (via data-link) guidance system, the Umkhonto has a range of 20 km. Denel Dynamics’ upcoming Umkhonto EIR variant will have a range of 30-35 km. The Umkhonto is available as a ground-based air defence system and as an anti-air warfare (AAW) module for surface warships equipped with vertical-launch system (VLS). According to Denel Group’s 2016 annual report, Denel announced that it was undertaking a $61.36 million U.S. contract to supply and integrate Umkhonto SAMs onto two Algerian MEKO A-200AN frigates (each ship is equipped with 32 VLS cells). Assuming one Umkhonto battery can include four eight-cell launchers, a per-battery cost of $30 million could be within Pakistan’s fiscal reach. Pakistan spent $62.2 million and €41.5 million per HQ-16 and Spada-2000-Plus battery, respectively. The Saab Giraffe AMB radar (which is used by Algeria’s MEKO frigates) cost the Philippines $12.5 million per radar (Saab has also partnered with Denel to integrate the Giraffe AMB to the Umkhonto). Theoretically, the Umkhonto platform could provide the PN with a relatively affordable SAM system that it can station on land and fit as an AAW solution on its warships, such as the F-22P and MILGEM (assuming it is designed to have space for VLS cells – like the LF-2400). Longer-range and higher altitude threats have generally been managed by the Pakistan Air Force, but the Army’s HQ-16 acquisition shows that the other service arms can assume greater ownership of their AAW requirements. It is not known if the PN still intends to pursue the Umkhonto – or medium-range SAMs in general – for its air defence requirements.